We have three systems simultaneously available to maximise throughput. A Dionex ICS-1000 cation system is available (left hand picture above) for measurement of a standard wet of cations (K+, Na+, Li+, Ca2+, Mg2+ and NH32-. The system utilises an isocratic pumping system coupled with electrolytic suppression to minimise background counts. The mobile phase is a low concentration (20-30mM) solution of methylsulphonic acid. 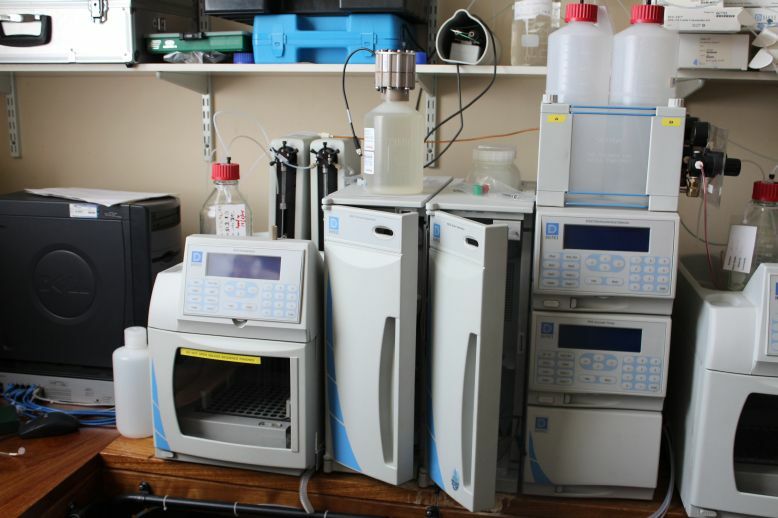 Analysis times can be as short as 4 minutes depending on the ions of interest and a high throughput is also achieved with an AS50 autosampler equipped with 49 or 99 sample racks (9ml or 500ul vials respectively). Detection is via an electrochemical cell. Column heating is also carried out for absolute retention time stability. A Dionex anion system is the second system available (right hand picture above). This is routinely set up for polyphosphate separation and measurement using a AS18 column and again utilising electrolytic suppression of the background. A unique aspect to this system is the online generation of eluents via an electrolysis method. This method simplifies the production of gradient concentrations, by eliminating the need for gradient pumps. As it is electrolytic, it allows for extremely high gradients to be generated. 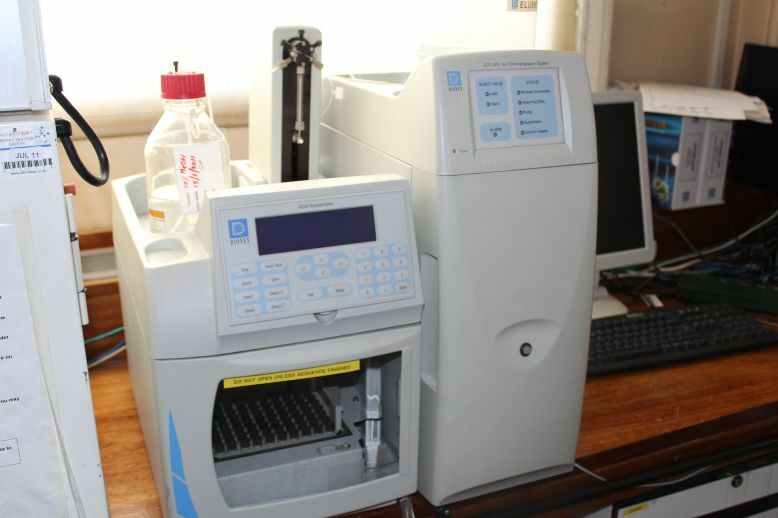 Again an AS50 autosampler is available to ensure high throughput. Detection is eletrcochemically and column heating is standard. The final Dionex system is for the speciation and measurement of transition metals and utilises a PAR postcolumn colorimetric reagent to determine the ions. 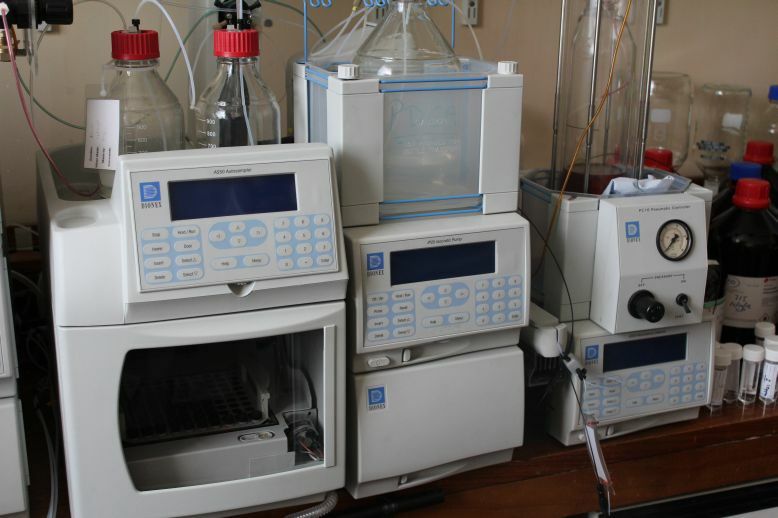 Detection is via a UV detector, so the system can also be configured for standard HPLC measurements. Again column heating and an AS50 autosampler are standard. All data collection and analysis is via the Chromeleon v6.0 suite of software which allows full control of all the systems simultaneously. As we have three separate systems each with an autosampler, a very high throughput can be achieved, thus allowing detailed multipoint studies to becarried out. The particular systems we have utilise extremely sensitive columns, allowing excellent separation of a variety of species. Also a very wide range of other columns are available for separation of a wide range of ions. Due to the electrolytic suppression and very sensitive detection cells, it is possible to routinely measure down to 0.1ppm. Work has been carried out on samples with concentrations as low as 0.01ppm. Report generation can be automated to allow output of the data direct to Excel via a user defined report generation template.